A massive white ramp towers over me, reaching endlessly to where the deep indigo sky meets the rim of the world. Thin banners of snow stream downwind off the slopes above, obscuring any possible view of the summit ridge. Mingma Sherpa is up ahead, waiting patiently, as he has for the last six hours after leaving our High Camp at 19,000 feet. For the hundredth time I marvel at his ability to climb so effortlessly in this thin air, and envy his Sherpa genes, and his youth. Mingma suggests we rest awhile and I slump into the snow, looking down slope and towards the north. If for no other reason, the view is worth the climb. 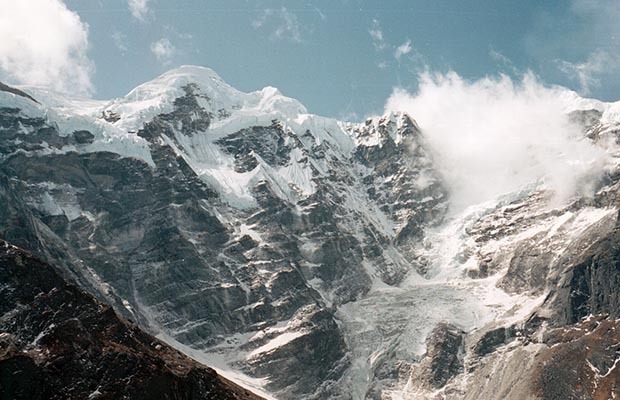 The massive black rock faces of Everest and Lhotse tower above us to the north. East to northeast is Kanchenjunga, Chamlang, Makalu and Baruntse. 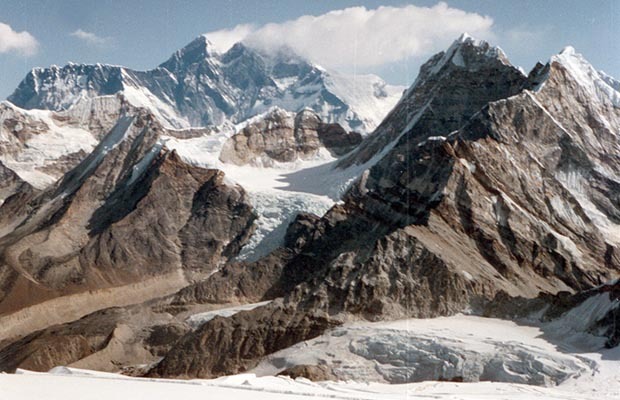 To the west are the peaks of Ama Dablan, Cho Oyu and Kangtega. 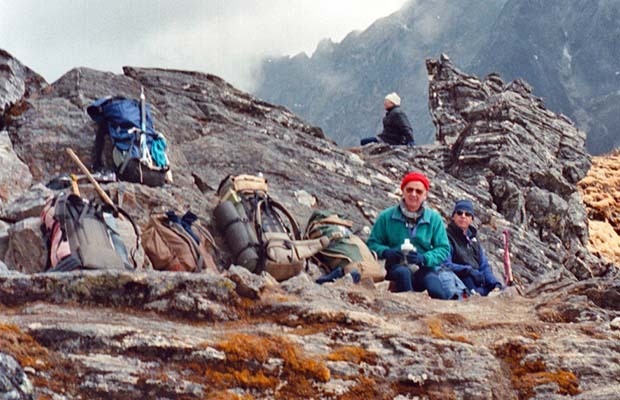 Six of the highest peaks of the World are in view from this vantage point. Should I be satisfied with this achievement? Mingma is silent. 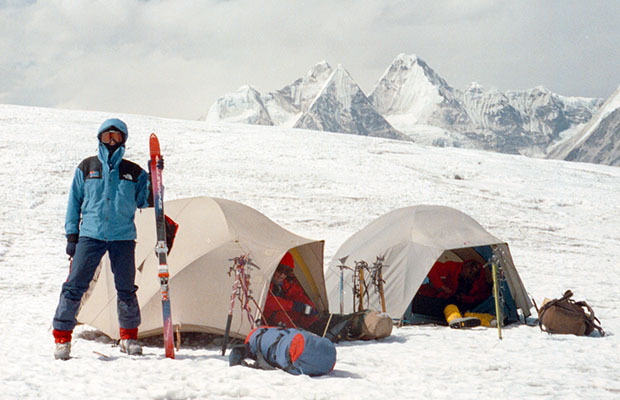 We're temporarily sheltered from the wind, and in the quiet I ponder my motives for being here .... Mera Peak, 21,300 feet, Nepal, March 1992. On the road to Jiri from Kathmandu. Morning at Jiri with the local ragamuffins ... waiting to move off. 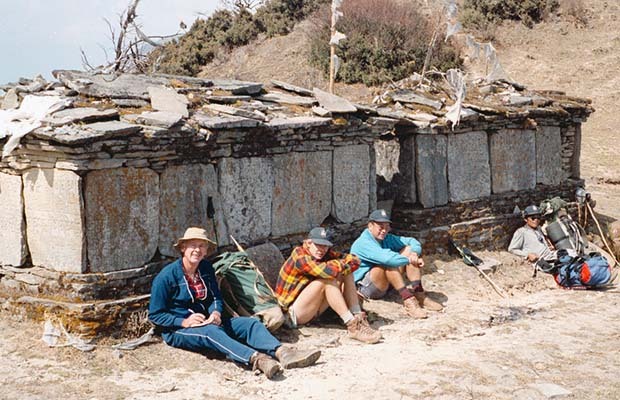 Sherpa Dorje and Martin passing through a village. Mal and Martin climbing one of the many ridges across the grain of the country. A mani wall on one of the ridges. Mal, Pete Twethewey, Martin and Dorje. Trying to relax in the village of Phaplu, surrounded by ragamuffins. Ragamuffins on one of the many swingbridges. 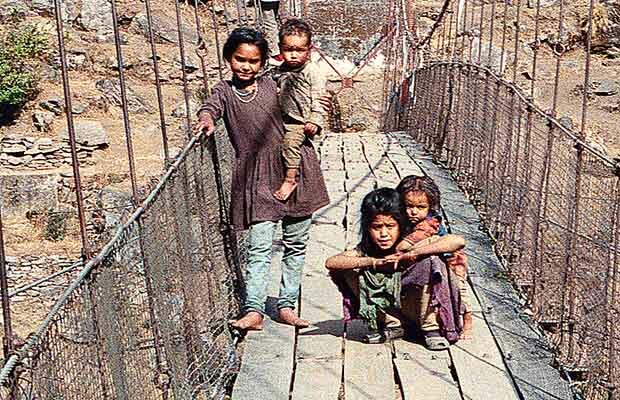 This struggle began in 1983, on a long strenuous high altitude trek in Nepal - the classic Annapurna Circuit. My traveling companion was Mal Hill, a 42 year old Aussie from Brisbane. We shared some limited climbing experience: Mal on rock faces, and me on alpine peaks. We coughed, hacked and stumbled our way around this Himalayan marathon in an effort to keep up with the other, much younger members of the expedition. Surprisingly, after four weeks on the trail, we both returned to civilization in good shape. We'd performed well against the fierce opposition of youth and re-entered Kathmandu victorious. 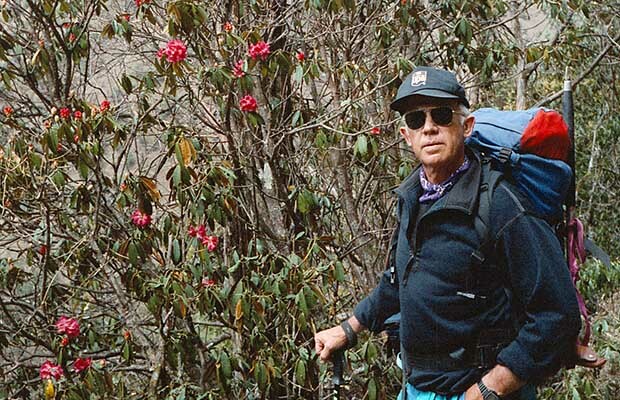 Two days later, rested, well fed, and downing a few pints of local beer, we mutually agreed that despite our aging bodies, we could probably ‘knock off’ a Himalayan 20,000 footer. So the journey to Mera Peak began. The return to Kathmandu is spellbinding; with the air, the smells, the people and the high snow peaks towering above the green hills to the north of the city. All so familiar and delightfully exotic. From the airport we're driven through the narrow noisy streets to take up residence in the Summit Hotel. What could be more appropriate for a group of intrepid mountaineers? At the hotel we meet our expedition leader for the first time. Mingma Dorje Sherpa; looks thirty but could be older, or younger, with an easy smile and relaxed manner. 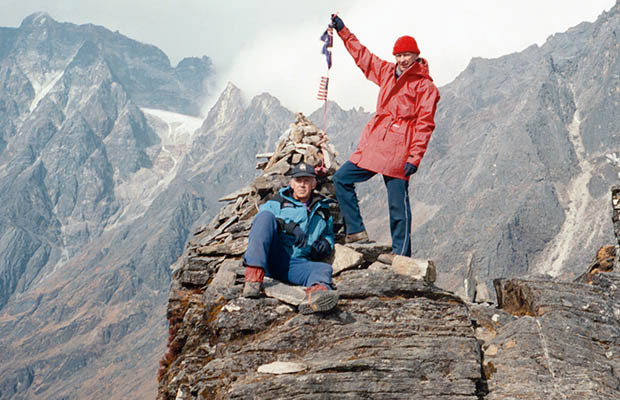 Mingma is a qualified high altitude guide and member of the Nepal Mountaineering Association. 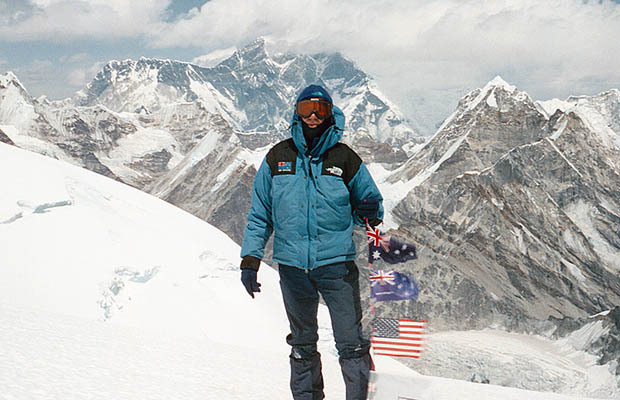 He's been on Everest three times, once reaching 28,000'. Another attempt involved an avalanche at 24,500' on the West Ridge. He survived with frostbite, but left behind a close friend, dead in the wreckage of their tent. Mingma outlines the rather extreme plan to walk from the village of Jiri [about 65 miles east of Kathmandu] to the summit of Mera Peak. 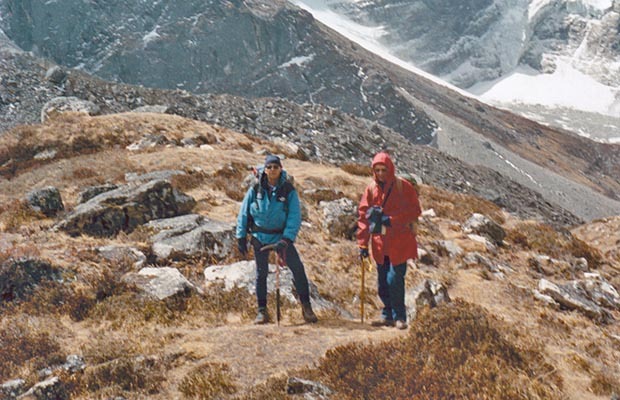 This along the route of the classic trek into the Solu-Khumbu and Mount Everest. 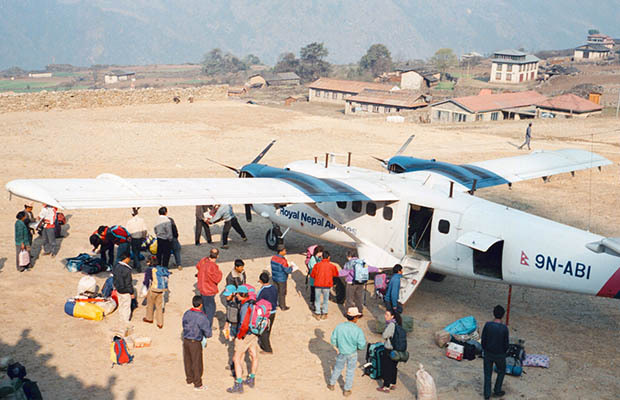 However, on return to the airstrip at Lukla from Mera, we would return to Kathmandu by airplane. 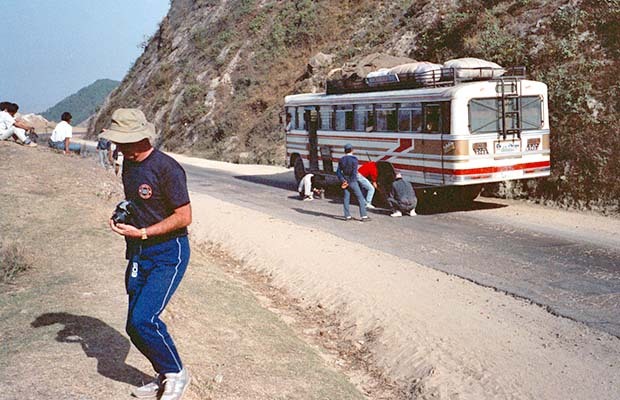 I've never enjoyed bus trips in Nepal and the journey from Kathmandu to the village of Jiri being no exception. The road is rough, narrow, and snakes up and down Himalayan foothills that would be classified as alpine peaks in any other country. The bus suffers two tire blowouts and other mysterious breakdowns. We climbers are kept out of the loop, with no idea what’s going on. Welcome back to Nepal! Remember to relax. Despite the apparent confusion, the Nepalese have a happy knack of sorting things out - it just takes time. Self and Mal on one of the Passes between Lukla and the Hinku Valley. 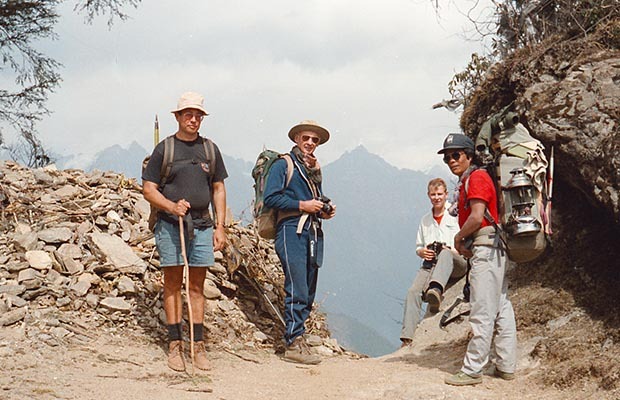 Russell, Mal and Pete on one of the high Passes between Lukla and the Hinku Valley. 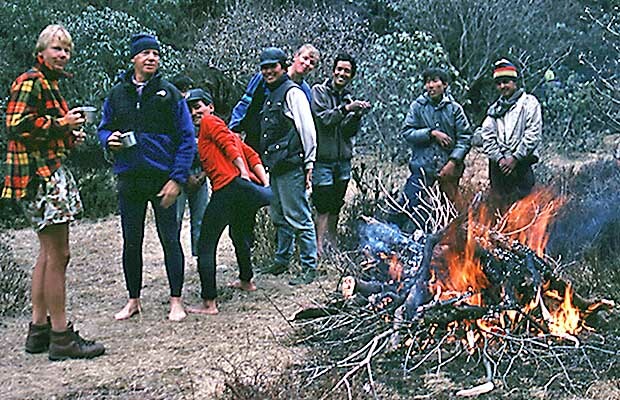 Our last camp before descending into the Hinku Valley. Another high point above the Hinku. Mal, self, Pete and Russell on the approach to Tangnang. 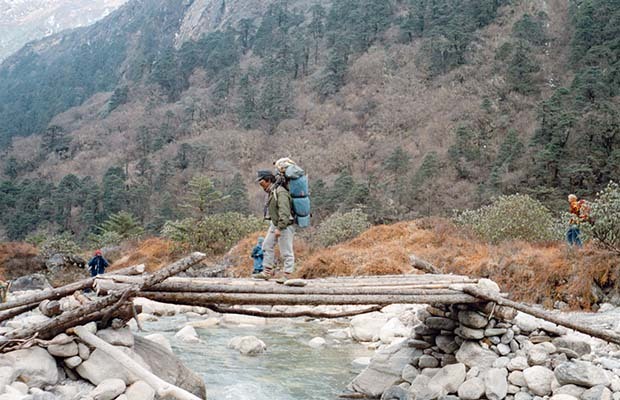 Pete and Mal crossing the Hinku Khola. 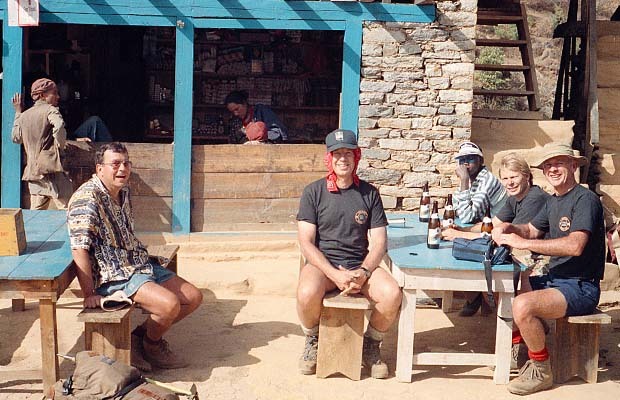 Self and Mal approaching our Base Camp at Dig Kharka. The north face of Mera Peak as seen from Dig Kharka. Crossing a flooded Hinku Khola without the use of a bridge! Drying out after the perilous stream crossing. Weeks later, the memories of Jiri, warmth, and the excitement of our first day on the trail are blown away by the deathly cold of Mera. I study the broken brown shell peeled from Pasang’s hardboiled egg lying on the snow between my cramponed boots. In the misery of imminent failure I attempt to divine a pattern of fate in the pieces of shell, as if they were prophetic leaves in a teacup. 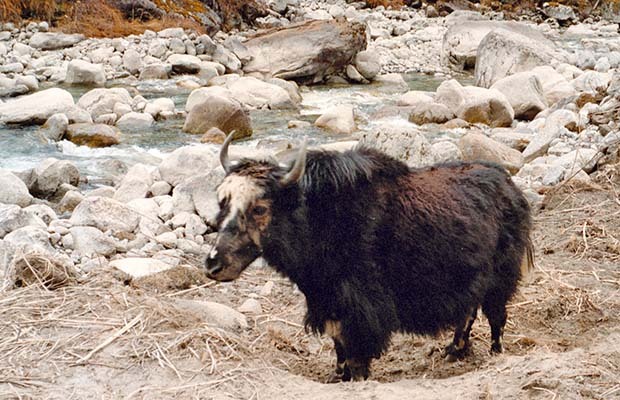 Mingma Sherpa is surely aware, as am I, that the day is passing and our progress towards the summit is painfully slow. I need an excuse to stop the agony and retreat without too much loss of face, convinced my 52 year old body will no longer survive the effort or altitude. 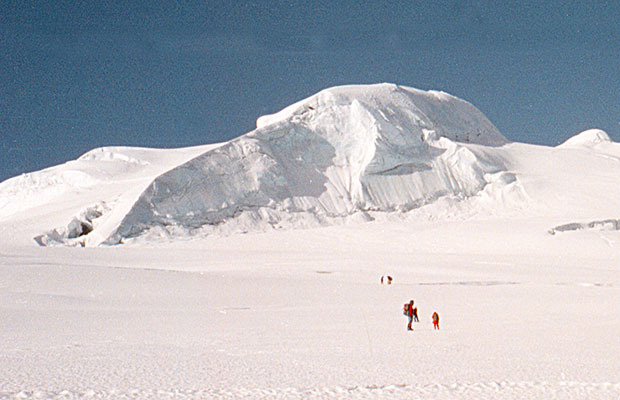 We’ve passed 20,500 feet - taller than Denali, and the highest I’ve climbed. Surely, this is enough, call it a day. It’s not really giving up, it’s the sensible thing to do, the responsible decision to make. 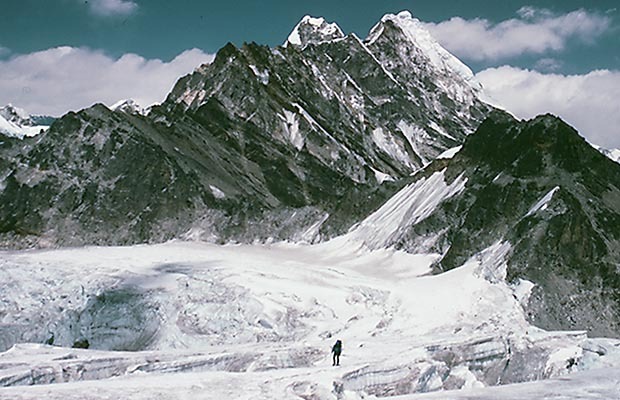 I gesture at Mingma to wait up, and slowly climb towards where he’s leaning on his ice axe, braced against the constant wind from the west. 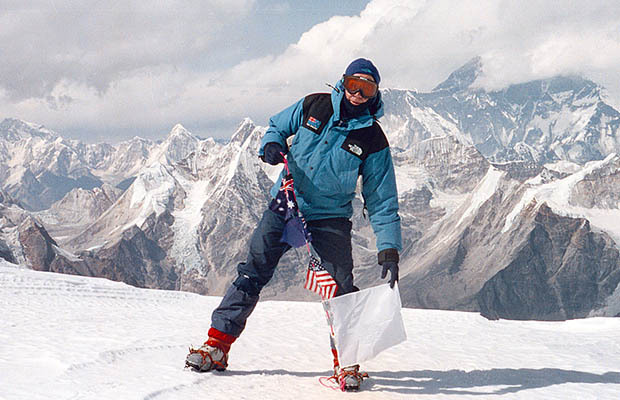 Dejectedly, I ask Mingma to take photographs that I’d planned for the summit, and pull from my pack the string of flags, prepared at Base Camp. At the top; Australia, then New Zealand and below, the Stars and Stripes. I face upslope, Everest at my back, while Mingma takes a series of shots. With the photos complete, Mingma hands back the camera, throws on his pack, turns, and heads off up the slope without a word. I feel obliged to follow. Wearily, I put on my pack, pick up the ice axe and set off in Mingma’s steps. I can’t believe I’m actually moving uphill again, albeit slowly. Ten paces, rest, nine paces, rest, eight paces, rest, as I run down to a maximum of five on the now much steeper slope. Mingma has psyched me into this. I reflect back to the many times I’ve climbed solo, when mental strength has determined the outcome of the climb - and not the physical. I’ve learned there are always more reasons for turning back than continuing to a summit and can recall retreating off more mountains than I’ve successfully climbed. But then, I’m still alive for this climb. My excuse today is respiratory disorder, but Mal believes I’ve been reading too much on the subject and talking myself out of the climb. Perhaps he’s right, but despite his astute perception and my mental justification for quitting, there is something seriously wrong in my chest. My lungs are burning with every gasped breath and a deep seated pain is a constant companion. So, I follow Mingma in the knowledge that I’ll possibly be carried off this mountain severely disabled. The last slope beneath the summit cone is almost level, but it still requires a tremendous effort to move one foot in front of the other. Despite the chest pain and the agony of physical movement, I marvel at my mental lucidity. Well above 21,000', without supplemental oxygen, I'm seeing and feeling things quite clearly. Blast the common cold and subsequent bronchitis - this would have been a day to remember - a truly great summit day. As it is, I feel like what I really am, a middle aged man stumbling about in places where I have no right to be. I’m ashamed of my performance in front of Mingma, and can only hope to finish this with some dignity intact. Crawling on all fours up the summit cone would not be appropriate. For the moment, we are the only two people on the mountain, the others are far below, already at High Camp, or even lower. I’ve read somewhere that those who live among, or at the foot of mountains see them as bridges between the human world and the dominion of the gods and I try to relate my perceptions to those of Mingma’s. What does he see and feel up here - is it the same as me? Certainly, I’m in awe of these massive piles of stone and ice, and that we are insignificant specks on this huge tilted landscape of Mera. But I don’t sense this to be a religious experience … rather an affirmation of faith in my friends, the passion to climb and Mingma. Perhaps, hidden beneath the pain and agony of each step there’s a feeling of transcendence, a knowledge that the future direction of my life will be changed on the summit of Mera. With these thoughts, I shuffle slowly upwards to where Mingma waits, between heaven and earth. The wind has dropped to a light breeze and the cobalt blue sky is almost clear of clouds as I begin the ascent of the summit cone. Mingma is sitting patiently on the down slope lip of a narrow crevasse. I feel relaxed, knowing the ordeal is almost over and smile happily at Mingma as I move up to the crevasse edge where he waits. His news is not good. The small protruding nose of ice on the upslope lip that enabled the others to cross, has broken away. We’re now faced with a yawning gap over which some serious mountain gymnastics will be necessary to reach the top of the summit cone. Furthermore, we have no protection against a fall: no rope or belay devices. I look up to the summit proper. It’s a mere fifty feet above where we stand. One thing is certain: I didn’t climb 21,300 feet only to fall unroped into a deep crevasse! For me, this is the summit. Enough is enough and I advise Mingma of my final decision. Let’s get down off this mountain before we do something stupid. On the climb from Base Camp to our High Camp. 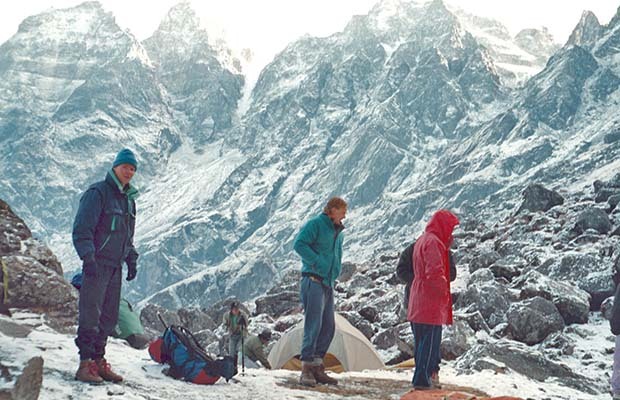 Looking down on Mera La from our High Camp. 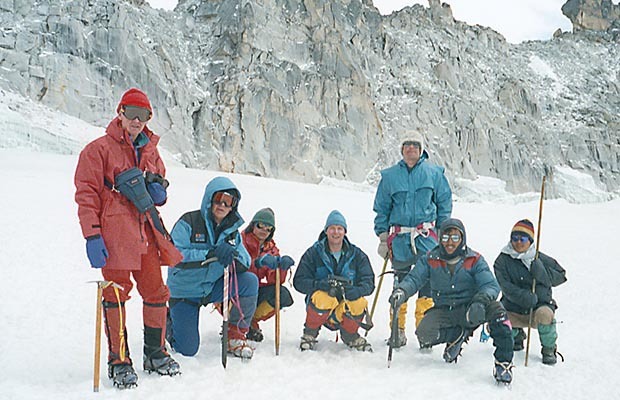 The climbing group near Mera La at 18,000'. Mal, self, Pete, Russell, Martin and Mingma. 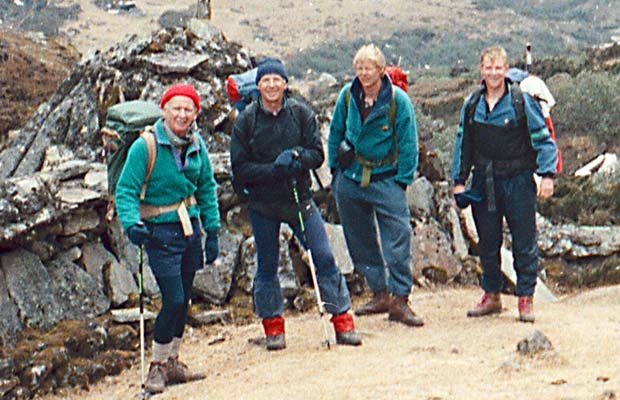 Setting off from High Camp for the summit of Mera Peak. 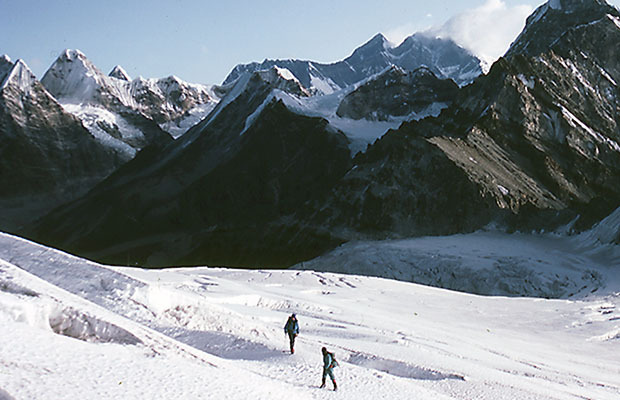 Looking north to Nuptse, Everest and Lhotse peaks. 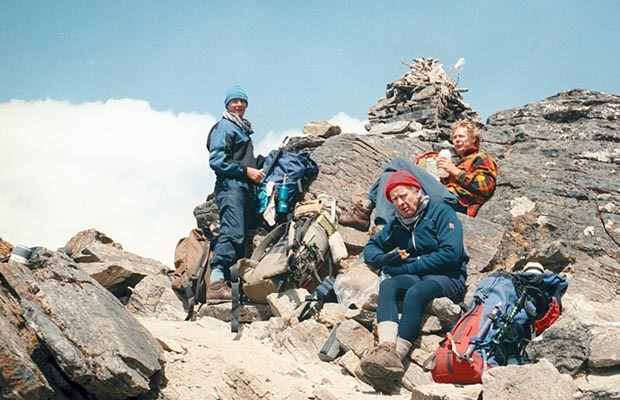 Taking a photo break on the climb to the summit of Mera Peak. 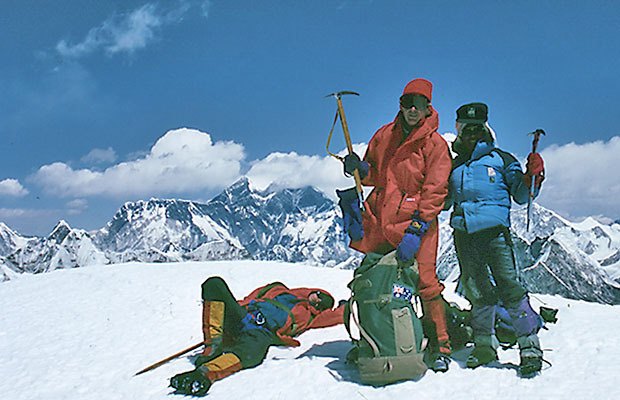 Pete [lying down], Mal and Dorje on the summit of Mera Peak. Self on the summit of Mera Peak. 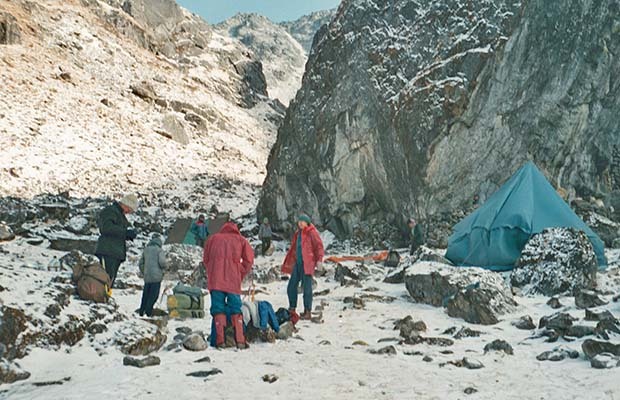 Camp near one of the high Passes above Lukla. 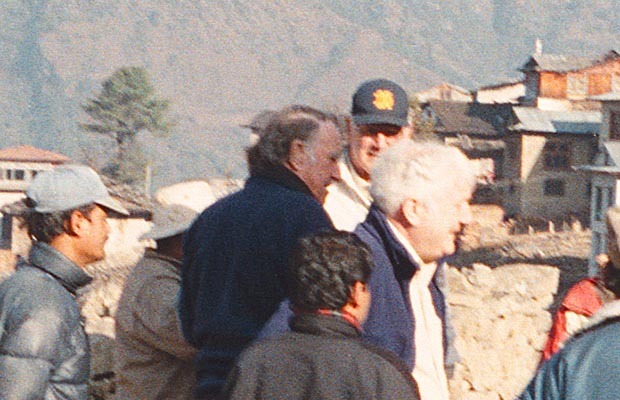 At the Lukla airstrip with Sir Edmund Hillary. 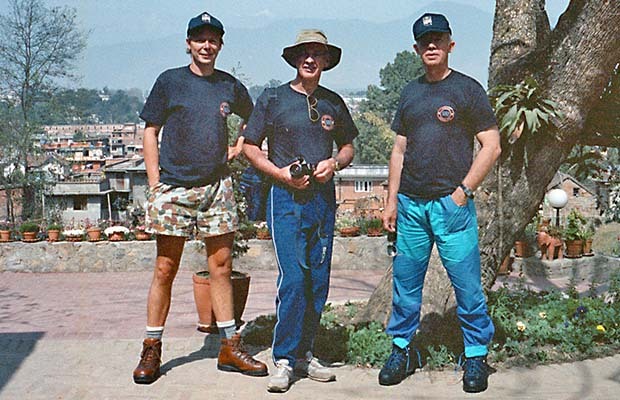 Mal, Russell and Pete on the upper section of Lukla airstrip. Our quick way home to Kathmandu without all the days of walking.